Introduction: Matilda Electa Gage (née Joslyn) was born March 24, 1826 in Cicero, New York, an eastern suburb of Syracuse. She was raised in an Abolitionist home that was a station on the Underground Railroad, and where she was taught multiple languages. She married Henry Gage at 18 and had five children. One of the woman’s movement’s philosophers, she was a skilled writer and organizer, active after her children were grown. She made her first public speech at the third national Women’s Rights convention in Syracuse in 1852, and rapidly became a leader in the women’s rights movement. Gage was throughout her career among the more radical leaders of the women’s right movement, and like Elizabeth Cady Stanton focused particularly on the role of social and religious institutions as well as civil concerns. Her writing focused on significant accomplishments of women in invention, military affairs, and in history. Career: Raised by abolitionist family in a home on the Underground Railroad, Matilda Joslyn Gage grew up to be not only an abolitionist, but a suffragist, author, and activist for Native American rights. She was adopted into the wolf clan of the Mohawk nation and argued for their non-gendered biased form of government. Gage joined the National Woman Suffrage Association, wrote for the Revolution, was an officer of the New York State Suffrage Association and later was president of both groups. She co-authored the first three volumes of the History of Woman Suffrage with Elizabeth Cady Stanton and Susan B. Anthony. Gage’s intellectual vigor made her one of woman’s rights most able philosophers but, fearing repercussions from her anti-church stand, the movement virtually wrote her out of its own history. Gage and Stanton co-authored the “Declaration of Rights” presented at a women’s demonstration that disrupted the Philadelphia Centennial Celebration (1876), in which women could not participate. Gage co-authored with Elizabeth Cady Stanton and Susan B. Anthony the first three volumes of A History of Woman Suffrage. She edited the National Citizen and Ballot Box, newspaper for the National Woman Suffrage Association. Believing that Church teachings on women’s inferiority were the greatest obstacle to women’s progress, she founded the radical Woman’s National Liberal Union, published a book, Woman, Church, and State (1893), her most widely known solo publication. She was also a prominent force in the “revising committee” of Stanton’s shocking book, the Woman’s Bible. In 1880 Gage became the first woman to vote in Fayetteville under a state law that passed permitting women to vote in school board elections. Gage’s views on suffrage and feminism were considered too radical by many members of the suffrage association, and in consequence, she organized in 1890 the Woman’s National Liberal Union, whose objects were: to assert woman’s natural right to self-government; to show the cause of delay in the recognition of her demand; to preserve the principles of civil and religious liberty; to arouse public opinion to the danger of a union of church and state through an amendment to the constitution, and to denounce the doctrine of woman’s inferiority. Brammer, L.R. (2000). 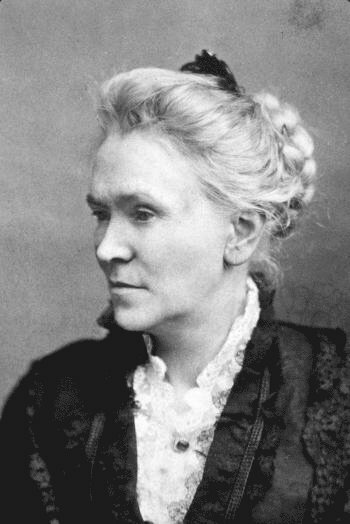 Excluded from Suffrage History : Matilda Joslyn Gage, Nineteenth Century American Feminist. Greenwood Press. Gage, M. J. (1893). Woman, Church and State : a Historical Account of the Status of Woman through the Christian ages, with Reminiscences of the Matriarchate. Matilda Joslyn Gage Papers, 1840-1974. Schlesinger Library, Radcliffe Institute, Harvard University, Cambridge, Mass. National Women’s History Museum. https://www.nwhm.org/education-resources/biography/biographies/matilda-joslyn-gage/ (Accessed: March 28, 2016).